Biting the Big Apple: About me! When I started this blog, soon after moving to New York 3 years ago, it was at the suggestion of a couple of my London friends who thought it would be cool if I documented my adventures in a new country and a new city. I used it as a sort of log of my observations, a personal record of my time here, and at times I must admit as a form of therapy too. I only shared my blog address with a small selection of friends and never thought that anyone else but them would ever read it. But it turns out that other people do too and the chances are that if you are reading these lines now, you are one of them. A fact that I find surprising, flattering but a little daunting too. Amelie is one of these readers and contacted me a few months ago. We exchanged a few emails back and forth, finding common grounds in our Expat status. Her blog, The Heimweh Safari, is great. Having moved here from Austria to study and struggling with feelings of homesickness, she started a rating system awarding points to the City for cool experiences or new discoveries, a bit like a treasure hunt. Amelie’s blog contains a couple of interviews of other expats and their experiences of settling here and making it home. I was honoured when she asked me to take part as well. You can read Part 1 of our 3-parts interview below here and on The Heimweh Safari. Stephanie is my guiding light. Apart from that, she’s French—yet British in her heart—and she moved to New York three and a half years ago. I discovered her blog a while ago (check it out it’s great!) and on that blog I found something that made me want to meet her urgently. In a post she wrote about how New York gave her a hard time at the beginning, yet how much it has become her home by now. Well, I thought, that sounds comforting to a homesick European like me. I need to talk to this girl. I sent her some questions and got an amazing, very long e-mail back. Too long to be posted in one go. Therefore, we decided to make it a series. In sequel 1, read about Stephanie’s moving to New York. When did you come to NYC and why? I landed in freezing cold and snowy New York on March 3rd 2007. I had been working for a major American financial services company in London for a couple of years and got promoted to a great job in our NYC head offices, heading up online marketing in their Digital Group. Did you come alone? Did you have friends in the city? I came by myself which was actually a huge deal for me. A year prior to my move, my boyfriend of ten years and I (amicably) split up so while the opportunity to move to New York couldn’t have come at a better time in my life, doing it by myself was also a very new, equally exciting and daunting, experience for me. I only knew three people in the City but I was so excited at the prospect of living here that I forgot to factor that into the equation … I have to admit that I did question my sanity as a result almost as soon as I landed! Were you homesick at the beginning? If so, what helped? As this is the second time in my life that I have uprooted myself and moved to another country (I moved from France to the UK 15 years ago), I’m not sure I really know what being homesick means. I am used to finding excitement in the challenges of learning to live in a new culture and noticing both the mundane and more fundamental differences. Having said that, I missed my friends a lot (and still do), closely followed by Waitrose groceries, Marks & Spencer lingerie (only British girls will understand me on this one), British television, decent Earl Grey tea and roast dinners! Thankfully NYC is a transient place and the people who live here know it and are therefore very welcoming of newcomers and I made friends quite quickly, not only through work but also through friends of friends who kindly and seamlessly included me in their social group. Being transient also means that the people you get to know come and go too, and friendships can be on one extreme very superficial or, on the other, very intense. I definitely have fewer friends here than I do in London. The Internet (already a huge part of my life) was crucial in helping me stay in touch with friends. I started some intense e-mail correspondence with my closest ones and Facebook helped fill the remaining gaps with the others. 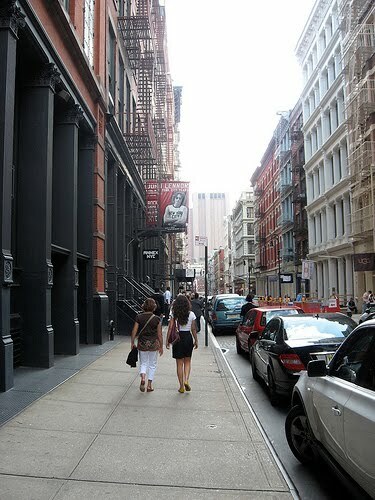 Read more about how Stephanie became a happy New Yorker in a week!